"Scrafty live in groups that beat up anything that enter their territory. The one with the biggest crest is the group leader. 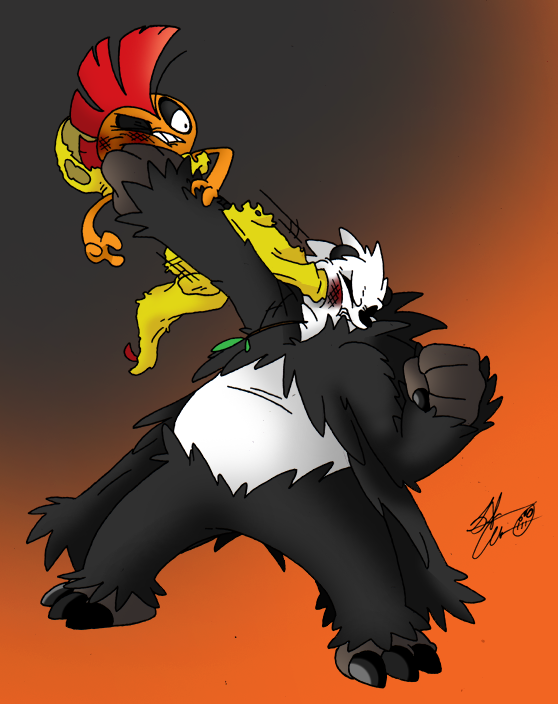 Each can spit acidic liquid from its mouth and can smash concrete blocks with their kicking attacks"
"Although Pangoro possesses a violent temperament, it won’t put up with bullying. It charges ahead and bashes its opponents like a berserker, uncaring about any hits it might take. Its arms are mighty enough to snap a telephone pole. It uses the leaf in its mouth to sense the movements of its enemies." So in the end I had to resign myself to purposefully giving Scrafty a low position if only because it would be unfair if I just slapped it into first place. I did struggle with the idea of not giving it a picture to itself but in the end I realized I've really drawn more then enough stand alone pictures of Scrafty, it would be nothing new at this point and hey, why not give Pangoro a little love? Also I'm a total sucker for the epic exchange of equally matched blows ala anime style and since these two can literally wipe the floors with each other due to their own typing I figured it worked; Scrafty is a bullying type hoodlum, while Pangoro hates bullying. I figured it was a good, worthy clash of characters... but that's me!